Those who remember the contentious 2004 presidential election might be a little surprised by Bruce Springsteen’s mostly silent voice during this latest electoral season. After all, the fight to stop George W. Bush from being reelected led the Boss to launch an entire tour aimed at getting out the vote to prevent one of America’s least-intelligent presidents from returning to office and doing yet more damage—damage that was subsequently done anyway, and turned out about as well as expected. (Spoiler: It went badly.) But the Jersey rocker is speaking up, and a forthcoming Rolling Stone interview contains his assessment of the Republican nominee for president. In it, Springsteen minces his words, and only goes so far as to call the flaxen-haired jagoff a “moron”: Truly, a demonstration of diplomacy on the part of the Boss. Well, you know, the republic is under siege by a moron, basically. The whole thing is tragic. Without overstating it, it’s a tragedy for our democracy. When you start talking about elections being rigged, you’re pushing people beyond democratic governance. And it’s a very, very dangerous thing to do. Once you let those genies out of the bottle, they don’t go back in so easy, if they go back in at all. The ideas he’s moving to the mainstream are all very dangerous ideas—white nationalism and the alt-right movement. The outrageous things that he’s done—not immediately disavowing David Duke? These are things that are obviously beyond the pale for any previous political candidate. As is his tendency, whether in song or discussion, Springsteen went on to briefly discuss the economic problems of the past several decades, and suggested that when people are hurting, the kinds of “simple…fallacious answers to very complex problems” offered by Trump can be very appealing. Which is true, and again manages to strike a deeply reserved tone against the man who deserves more accurate monikers, like “Douchebag who lies so much, he makes normal politicians resemble Mark Twain.” Given that he’s not engaged in anything like his 2004 actions, Springsteen is then asked if he’s perhaps lost faith in the ability of musicians like himself to effect change. Of course, he also says he thinks Hillary would make a “very, very good president,” which means a significant portion of readers will then retroactively discount everything he said prior to that endorsement. 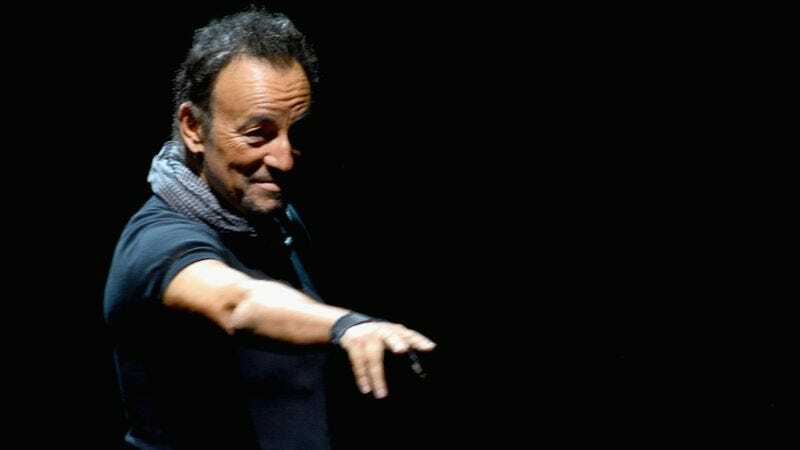 Still, if it means he’ll roll through town again soon, we would strongly encourage Springsteen to launch another tour disguised as a get-out-the-vote drive. Oh, and voters would really love it if he opened with “Tenth Avenue Freeze-Out,” we hear.